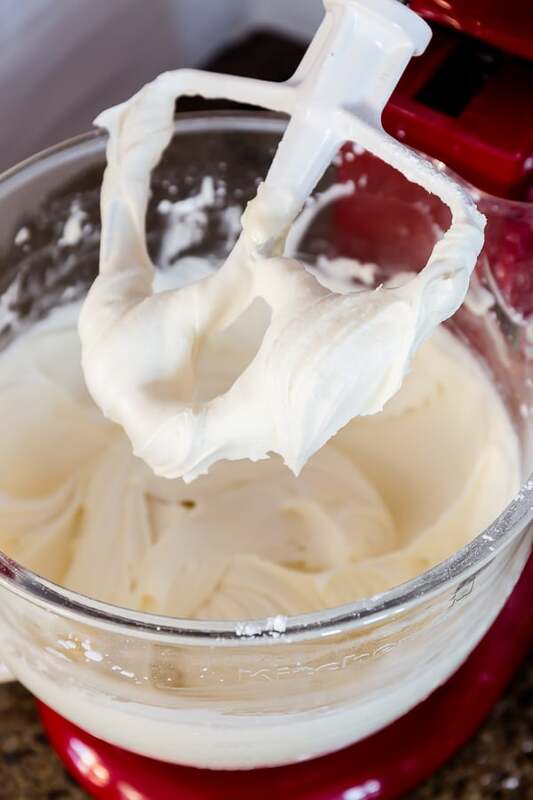 Learn to make the best cream cheese frosting with my proven tips and troubleshooting guide for light and fluffy frosting that’s thick enough to pipe. Cream cheese frosting is an absolutely fantastic frosting of all times! 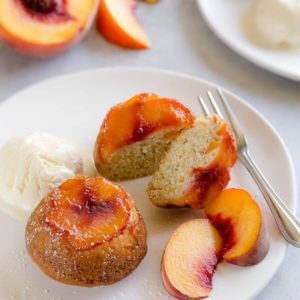 So creamy, light and fluffy, sweet and slightly tangy, it’s, hands down, one of my favorite frostings! You can never go wrong with a good cream cheese frosting. Red velvet cake (or cupcakes), carrot cake, or any cake for that matter pair beautifully with this deliciously creamy tangy frosting! And it’s really quick and easy to make it too. But there’re a few rules to get that ultra smooth, light and fluffy cream cheese frosting that is thick enough to pipe on cupcakes. 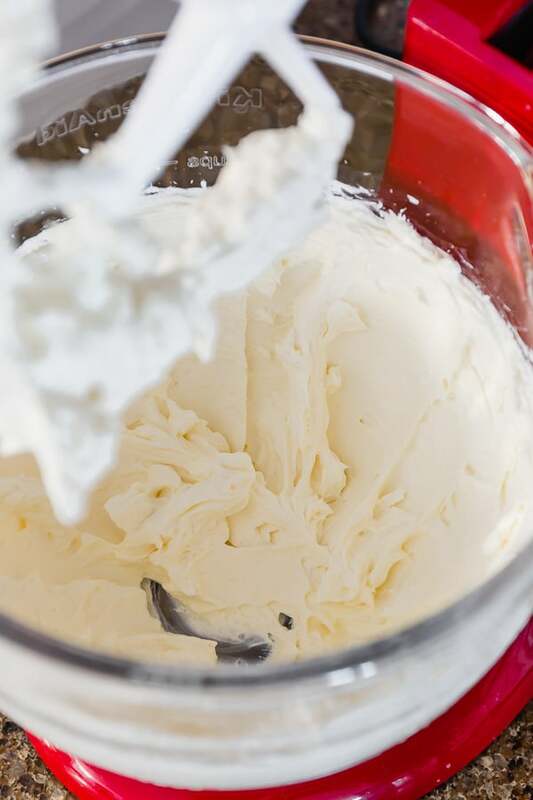 The only “secret” to the perfectly smooth frosting is softened cream cheese and butter. Simply take cream cheese and butter out of the fridge for 1-2 hours in advance. 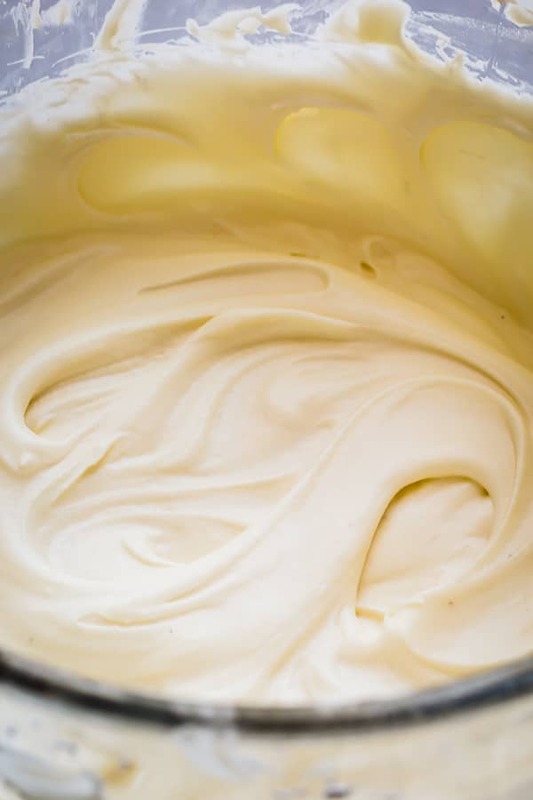 This is very important, because cold cream cheese won’t whip up as smooth as you want it to be and your frosting may end up lumpy. 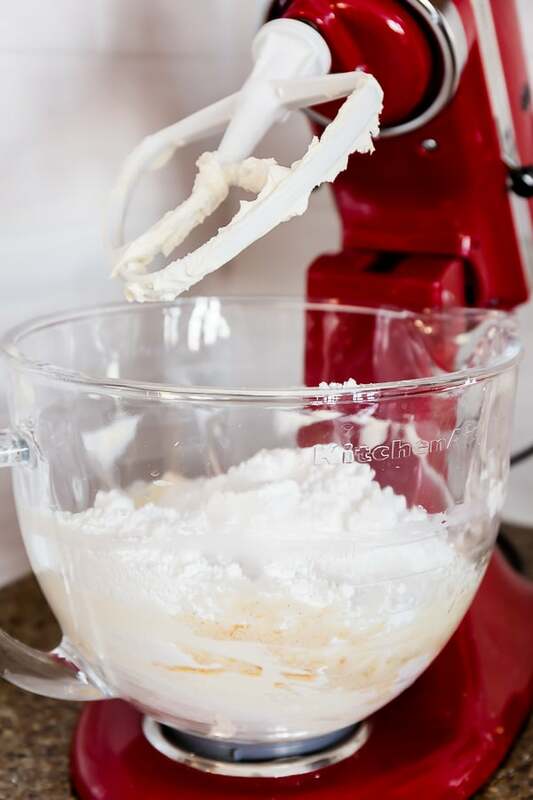 And before you start making your frosting, read through the following troubleshooting guide to avoid any mistakes that could ruin your work without salvage. Why my cream cheese frosting is runny? Make sure to use full fat brick-style cream cheese for frosting. Brick-style cream cheese is thick and has lower water content, which is very important to make thick frosting. Reduced fat or low fat cream cheeses or cream cheese spreads contain higher water content, which melts the sugar making a cream cheese soup. Make sure the butter is not too soft. Room temperature butter should be firm yet soft enough to leave a little dent when you push on it. Don’t add too much liquid in your frosting. Up to 1 teaspoon of liquids, like vanilla extract, would be ok. Also add the additional liquids at the very end, so that it won’t melt the sugar causing runny frosting. If you need to add more flavorings, opt for dry flavorings, like lemon zest, vanilla paste or vanilla beans, freeze-dried fruit powders, etc. Be careful not to over-beat the cream cheese and butter, or the mixture will heat up and melt the sugar, again making a soupy frosting. 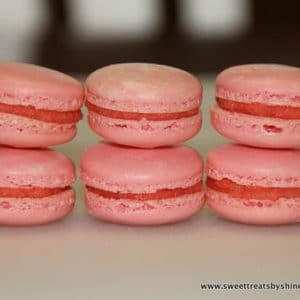 How to fix runny cream cheese frosting? Adding more powdered sugar won’t help you if you already got runny frosting. The reason for your runny cream cheese frosting is that there’s excess moisture in it, and adding more sugar will just melt it. Also, putting it in the fridge won’t help in this case as well, because moisture doesn’t thicken in cold temperature. Instead, try adding up to 1/2 cup of cornstarch into the runny frosting. 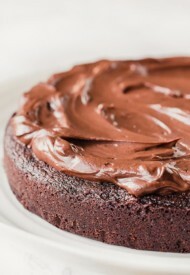 Cornstarch helps to thicken the frosting without altering the flavor by absorbing excess moisture. Why my cream cheese frosting is too sweet? If you think your frosting is too sweet, add a pinch of salt and it’ll be much better! Why my cream cheese frosting is grainy? This could happen if there is not enough moisture in the frosting, and sugar isn’t incorporated properly. Try adding 1-2 tablespoons of heavy cream and whip it again. Why my cream cheese frosting is lumpy? It’s likely that you used cold cream cheese. 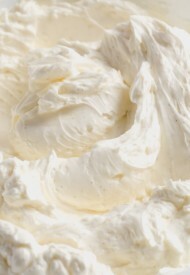 Make sure to soften your cream cheese at room temperature, about 1 hour on the counter. Also, check your powdered sugar. If it has lots of lumps, I suggest sifting it before adding it to the frosting. 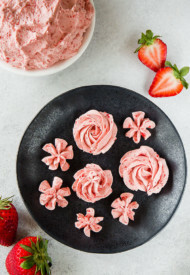 Can I make cream cheese frosting in advance? Yes, absolutely! Keep the frosting in an air tight container in the fridge for up to 3 days. Re-whip before using. Does cream cheese frosting need to be refrigerated? Yes, keep the frosting in the fridge until ready to use. 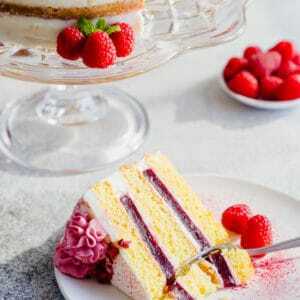 And cakes and cupcakes decorated with cream cheese frosting should also be refrigerated as well. 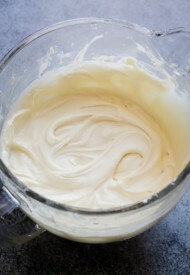 In a mixing bowl with paddle attachment, beat cream cheese and butter on medium high speed until fluffy, about 1 minute. Add powdered sugar and beat on low speed for a minute. 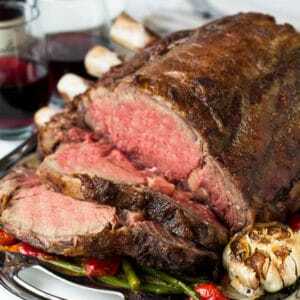 Then increase the speed to medium high and continue to beat until smooth and fluffy, about 3 minutes. Stir in vanilla extract and salt. Whip again until incorporated, 30 seconds. 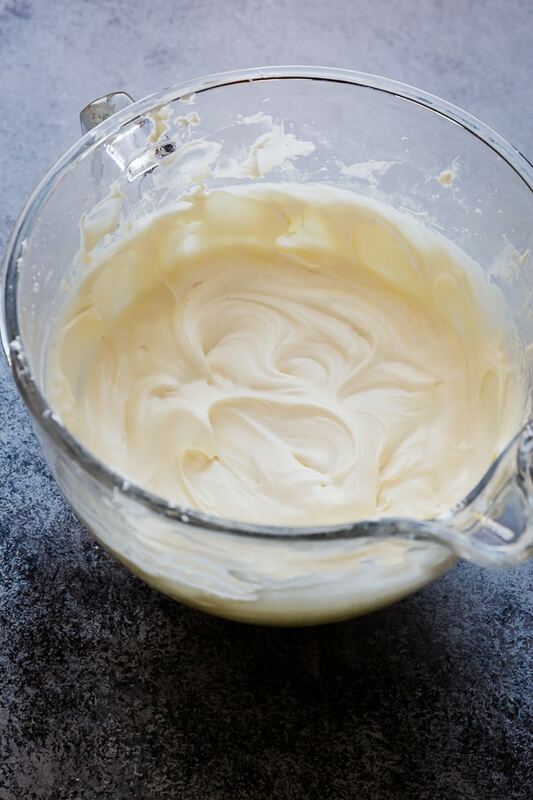 Make-Ahead Tip: Keep cream cheese frosting in an airtight container in the fridge for up to 3 days, or freeze for up to 3 months. Re-whip before using. To thaw frozen frosting, transfer into the fridge and thaw it overnight. 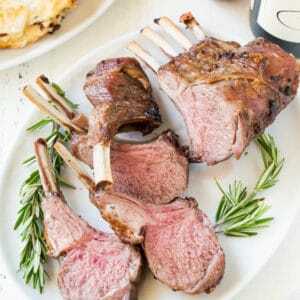 This recipe was originally published on March 26, 2013. 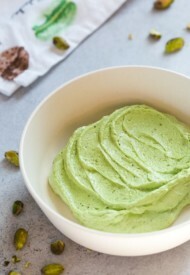 I love all your recipes but I get frustrated because you don’t offer a simple way to add a recipe to a Pinterest Board. I know you have a page with all your boards and many recipes to look through but I cannot “pin” anything. Am I missing the symbol to pin the recipe I’m looking at to my board? Hi, Annabelle! Thank you for your feedback, and I’m sorry for causing a frustration. I had just deleted my social sharing buttons due to security issue, and I hadn’t replaced with new ones. I just installed Pinterest button on images now. If you hover over the image (or click on image on mobile), you will see red “P” button. Click on that button to save it to your Pinterest board. Again I appreciate your nudge. Hope this helps. I’m so happy you enjoy my recipes. Please don’t hesitate to reach out to me with any other questions/ concerns.